Ocean City Maryland! What a great unique vacation beach resort! The weather is warm and inviting, the ocean and white sand beaches sparkling. The famous Boardwalk buzzes with activity and the entertainment is unsurpassed. 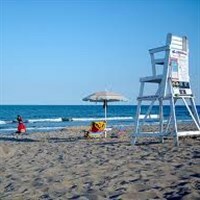 Come with us to Ocean City, Maryland and see why it has long been called "The East Coast's Number One Family Resort". We will be staying at the Howard Johnson Plaza located at 12th and Boardwalk. The hotel has free WIFI access, heated indoor pool and Jacuzzi, an on-site restaurant, beach accessories and bike rentals nearby. All rooms feature microwaves, refrigerators, 32-inch flat screen TV, coffee maker, hairdryer, in-room safe and private balconies. With a brief rest stop, we will travel directly to Ocean City, Maryland to make the most of the beach and boardwalk. Our lodging for the next four nights will be at the Howard Johnson Plaza, located on the boardwalk. This afternoon when our rooms are ready*, we will check-in. Your four days will be free to enjoy Ocean City as you please. Relax on the beach, walk the boardwalk, visit the city's amusements of all kinds - the choice is yours. This morning, we will check-out of the hotel at 11:00 AM. You will be free to run back to that favorite shop on the boardwalk, catch a few more rays and grab your lunch before departing. We will leave Ocean City by 1:00 PM. *You will want to pack your beach clothing in a carry-on bag, separate from your other luggage. This will eliminate confusion upon arrival. Since we plan to arrive in Ocean City early in the day, all the hotel rooms will not be ready for us immediately.